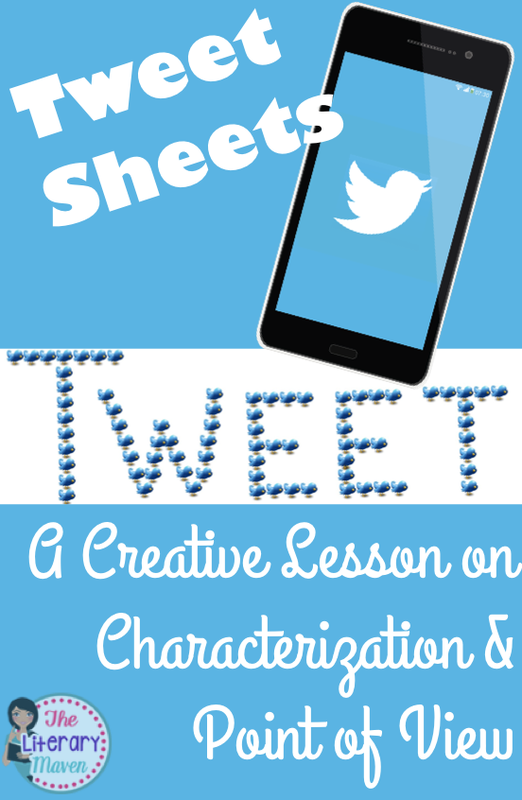 Let me first say that at the time I created this lesson, I did not have a Twitter account. I didn't even really know how Twitter worked. But I did know that my high school students liked Twitter. Some of them loved Twitter. Some of them would write their Twitter handles on their classwork, on their folders, on my white board when they thought I wasn't looking, everywhere. With that in mind as I was planning activities for my literature circles at the beginning of the year, I thought why not make reading more fun and exciting by connecting it to something my students already think is fun and exciting. My students had a choice of five novels, all on the theme of coming of age, at the start of the year. The novel they selected determined which literature circle they were in. One day a week was dedicated to these literature circles. Students had fifteen minutes to read silently and independently before working with their group on an activity for the rest of the period. the concept, I used the story of Goldilocks and the Three Bears. I asked students what they knew about Goldilocks (she had curly hair, she wasn't afraid of anything or had "no rap" as my students would say, broke into people's houses, etc.). From our list of ideas, I asked students to come up with a Twitter handle for Goldilocks. What would she call herself? My favorite possibility was @CurlyHairDon'tCare. My intro was short and sweet. The kids got it and got excited. In their groups, students then listed six characters from their own novel and described each character using evidence from the text. 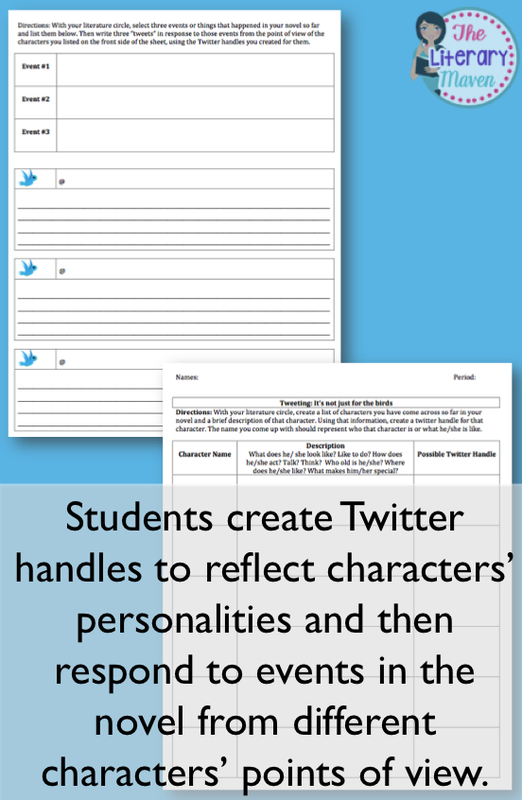 Using these descriptions, they created possible Twitter handles for the characters. On the reverse side, students listed three events that occurred so far in their novel. Finally, students selected a few of the characters and their Twitter handles from the front side to use to respond to the events. 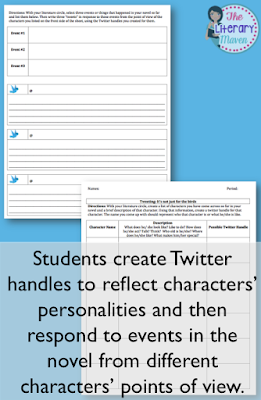 Students were directed to use first person as they wrote their tweets and think about how the character would think and feel about the events in question. 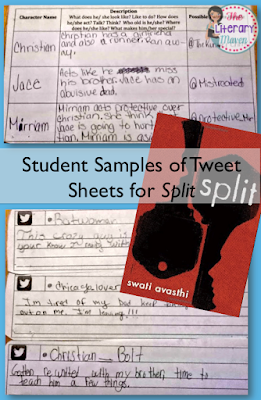 At the end of class, students were given a packet of tweet sheets to complete as they continued reading their selected novel. This was their "homework" as they read, to be collected upon completion of reading. 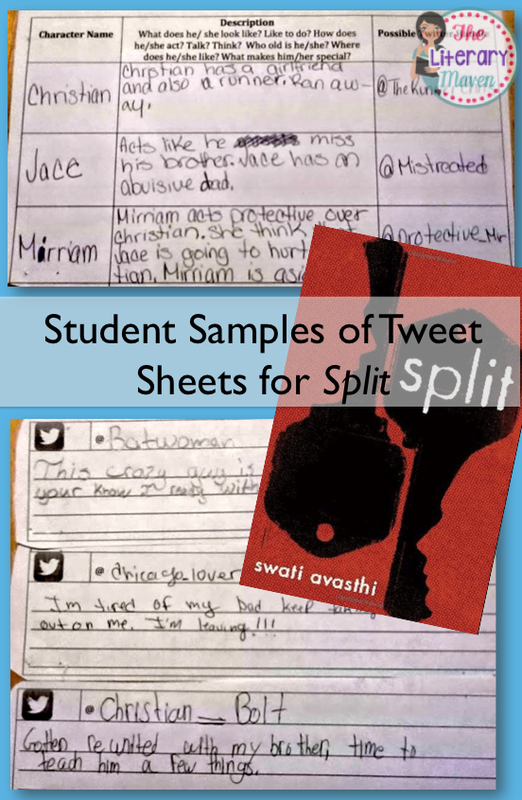 I asked that they complete one tweet per chapter or section of their novel to make sure their tweets were spread out. You may ask students to do a tweet for every certain number of pages read. The last page can be copied as many times as necessary. This activity could just as easily be used with a short story or nonfiction text. Be prepared to read some hilarious things, but also some sad and serious ones (depending on your choice of texts). If you try out this activity with your class, I would love to hear how it goes! You can find the resources for this activity here. 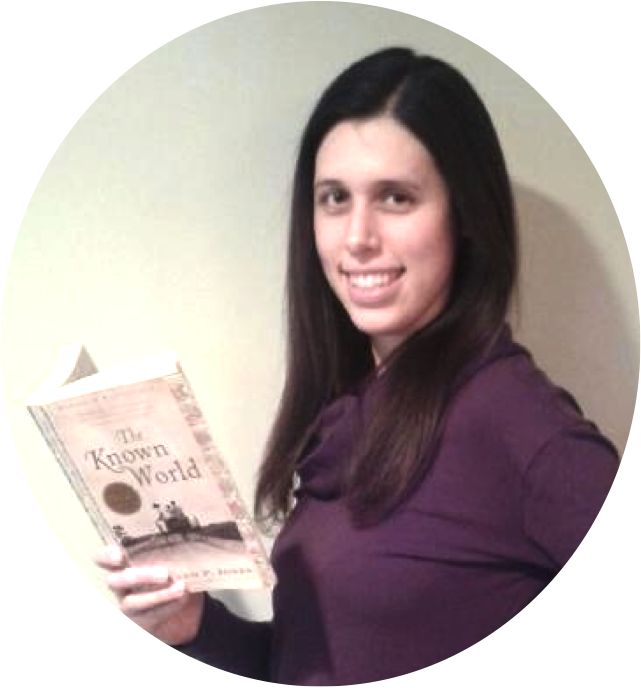 If you are looking for more literature circle activity ideas, check out my posts on literary postcards and character silhouettes. What a cool idea to tie in literature with Twitter. The Twitter handles and comments your students came up with were very clever! Its also a nice way to keep them on track with their daily reading. This is a great way to engage them in the story. Have you ever considering having students actually post to Twitter related to a story you were reading? Pre-twitter I used to use discussion forums to get my students discussing topics. Check out this link for easing in to Twitter if you're interested. Thanks for sharing! Thanks Shane. I think this activity is an example of what it looks like when students are engaged, but also doing high level thinking. We had a lot of fun with this, but it was also meaningful work. I have heard that there are some authors on Twitter so next time maybe we will follow authors and tweet at (if that is a thing you can do) them. Thanks also for the linked article. One I get all my other social media under control maybe I will venture onto Twitter. I used "tweets" in my 8th grade classroom. They loved them. I love this activity you came up with. Thank you for sharing! You are most welcome and I'm glad to hear Twitter is popular across the board. It is neat to be able to meet students where they are.